In our computerized world, children inevitably become familiar with various devices including smartphones and tables. Often this happens at a rather early stage, and since children don't always realize that online activities bear plenty of threats and risks, responsible parents should take greater part in kid's experience with electronic devices. Deciding at what age a child should start using devices is sometimes overlooked; still it's a very important issue. Children are different and mature at different ages, therefore choosing the right moment to introduce a kid to a high-tech device is rather individual. The very first thing parents have to do is to teach their children to treat any device with due respect and care. 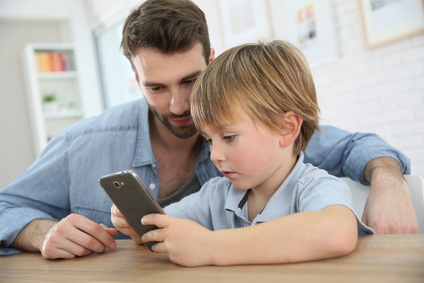 Apart from possible financial loss from a broken device, parents have to be aware of other risks, such as social interaction with the outside world. Children can easily get excited with new possibilities and online world can be seen as a sort of adventure. While surfing online or trying new apps they can encounter adult oriented materials, disclose certain personal information or even incur monetary charges. The latter can happen while using apps based on the so called "freemium" model. It makes sense to get familiar with the characteristics of the games installed on devices, see if there are any subscription fees or hidden charges for tokens. This is something parents constantly need to regulate. Ultimately it's the parents who are responsible for their children's safety, and that includes online safety too. In some families kids are allowed to use devices only with parents' permission. Every situation is unique, and it's hard to say whether this will be an appropriate decision for your kids. What you can do alternatively is to set a screen lock so that it will be impossible to install any new application without you knowing about that. This will give parents a possibility to see for themselves whether an application is safe. Another option is to install a spy program to monitor the activities of your children. Virtual world is full of dangers and communicating with your children is always good. Talk to them often explaining what activities are acceptable and what they should never be doing. Breach of the rules can lead to a temporary revocation of the tablet or smartphone. Teach your kids good manners; they have to know it's not acceptable to use devises when someone is talking to them. Whatever your situation is, children require monitoring. This also means parents have to educate themselves to stay informed about the dangers of online activities before determining whether a child is mature enough to handle internet access appropriately.